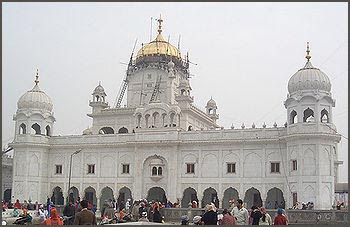 is a Sikh shrine in my home town Patiala in India. The literal meaning is "elimination of suffering". is situated in what used to be the village of Lehal, now part of Patiala city. According to local tradition, supported by an old handwritten document preserved in the Gurdwara, one Bhag Ram, a jhivar of Lehal, waited upon ninth guru of Sikhs Guru Tegh Bahadur during his sojourn at Saifabad (now Bahadurgarh), and made the request that he might be pleased to visit and bless his village so that its inhabitants could be rid of a serious and mysterious sickness which had been their bane for a long time. The Guru visited Lehal on Magh sudi 5, 1728 Bikram/24 January 1672 and stayed under a banyan tree by the side of a pond.The sickness in the village subsided. The site where Guru Tegh Bahadur had sat came to be known as Dukh Nivaran, literally meaning eradicator of suffering. Devotees have faith in the healing qualities of water in the sarovar attached to the shrine. Raja Amar Singh of Patiala (1748–82) had a garden laid out on the site as a memorial which he entrusted to Nihang Sikhs. Records of a court case in 1870 mention a Guru's garden and a Nihangs' well being in existence here.In 1920, during a survey for the proposed construction of Sirhind-Patiala-Jakhal railway line, it appeared that the banyan tree under which had sat Guru Tegh Bahadur would have to be removed. But men charged with felling it refused to touch it. Dukh Nivaran's stairs . . .